This past November, Sandals Resorts Inc, was kind enough to open their doors to us (as well as hundreds of other agents) on a travel agent only trip that allowed us to visit their Beaches Turks and Caicos resort for 2 nights so that we could familiarize ourselves with the resort and then be able to sell it to our clients. Here is exactly what I have been telling ALL of my clients. After a 3 hour chartered flight from Newark, NJ we were navigated through immigration/customs quickly (customs had set up extra booths to accommodate all of us since we were a huge group and there were already other people going through immigration/customs as well). Once outside, we were ushered to a van and given our room numbers to be placed on our bags (this way our bags would be sent to our rooms as soon as we arrive). The ride was no longer than 10 minutes and before we knew it we were pulling up to the resort. We knew the resort was huge before arriving, but the long ride down the driveway confirmed it. When we pulled up in the Caribbean village for check in (there are 3 villages all with their own private check in areas) we saw a man with a keyboard playing music to welcome us. As we stepped out of the van our jaws dropped. Staff was everywhere, smiling and greeting us, and then we saw Bert and Ernie. I haven't watched Sesame Street since I was a kid, but in that split second I digressed to my childhood days and had the urge to run to them and throw my arms around them. I can only imagine how a child must feel when they arrive at the resort and see their favorite Sesame Street characters waving at them. 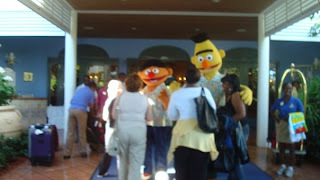 Bert and Ernie hugged every single guest who arrived at the resort and even stopped to show off for the camera since I was video taping the entire thing. Behind the welcoming committee were two employees handing out cold towels and a basket to discard them in. Before we knew it we were being whisked away to a conference room for our private check-in reception (which is used for big group check-ins). There we were greeted with rum punch, champagne, snacks (bags of pretzels and chips and finger sandwiches). Group check in was a breeze and once done, we were told to go enjoy lunch. We made our way outside and were directed to the Arizona buffet (by the Caribbean pool). The food there was wonderful. Being Caribbean/Mexico destination specialists we've traveled to quite a few All-inclusive resorts and the buffets are always so-so. This place had the best food we've ever had on vacation, and we would have still said that even if all they had were buffets. After lunch, we took a guided tour of the property and were shown some of the rooms. Before coming to this resort I would have advised my clients to book at the cheaper Beaches resorts (Sandy Bay in Jamaica) so they could have a nicer room with a view of the ocean for the same price as a lower category at BT&C. I was SO WRONG. I would have taken the lowest category here ANY DAY over any other resort. The decor was beautiful, the views (while not of the ocean) were still breathtaking (especially in the French Village) and at this resort you will barely be in your room and if you do spend time in there you'll be watching the nice big flat screen TV, not looking out the window. The oldest and most spread out of the 3 villages. There are 4 pools (including a kid's pool by Camp Sesame). The relaxing sounds of the Caribbean pool’s waterfall, especially it's pretty colors at night. The newest and fanciest of the 3 villages. There is one giant pool. The Kid's grille (snacks, burgers, hot dogs, fries, etc). This village is set back from the ocean and is almost in it's own quiet little world. 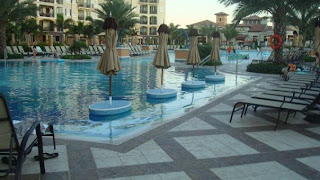 It has two pools (a large pool and a smaller pool attached just for children). and the feeling as if you stepped back in time to the palace of Marie Antoinette. This section is a resort in it's own. Bobby D's restaurant is located here. Even the swim up "bar" for the kids, that served "mock"tails! This place was brilliantly thought up and fun for ALL ages! After our tour of these areas we were escorted back to the main check-in area and given our room keys. We made our way to our room #3341 which was in the Capri building in the Italian Village. We opened the door and were ecstatic to see the ocean through the windows to the balcony. We never dreamed Beaches would put us in one of the best categories they had so we felt really lucky to have been given a chance to actually experience one of these rooms. Upon walking in the door you will find yourself in a small room (the kid's room) with a bunk bed and a trundle bed underneath them. A closet and a sink which was just the right size for smaller children to reach.There was also a flat screen TV in there with an Xbox system, 2 controllers, an a game. and a toilet with a door for privacy. The wood doors and bed frames and decorations were absolutely gorgeous throughout the entire room. Across from the bathroom door is a door to a living room area (which we did not have access to). If you book the room with the living room suite as well you'll get an extra 3 beds and a butler with your room category. We then continued into the bedroom area which was beautiful. There was a mini fridge/bar with everything you could ever need, including a microwave and popcorn bags! and a single arm chair in the corner that actually pulled out into a twin bed (could easily fit a child or small shaped adult). and an iPod docking station as well. The bed was the MOST COMFORTABLE BED EVER. I still cannot get over how comfortable those beds were. In fact, my co-worker, who also happens to by my fiance (we co-own the agency, My Paradise Planner) actually referred to the bed as an "angel's cloud". 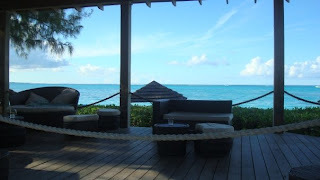 I still lay in bed at night wishing I was in that bed back in Turks! Then came my favorite part, the balcony. The doors to the balcony are synced up with the AC unit, so once the balcony doors are opened the AC shuts off automatically. Once outside you have a beautiful view of the ocean, since the Capri building is oceanfront. and a table with 4 chairs. There is also a door leading to another balcony with 2 padded chairs, another double lounge chair and a table for 4. This is for those who have the living room added onto their category. Next time we come here with a group we will definitely book this room because there was more than enough room for everyone. and a champagne party at the club. I am sure if we had been there for a whole week we still wouldn't have been able to do everything there. but because of that we missed the Kitty Kat cruise, which we heard was awesome because there was a slide on the back of the boat so people could slide into the ocean and snorkel. A word of warning. There is a lot of area to walk at this resort so I recommend that people who have trouble walking for long periods of time book rooms closest to where they want to spend most of their time (like the beach). Speaking of small kids, the kids club was also a genius touch, considering you can drop off your child of any age there at any time of the day and all the Sesame Street characters, along with professionals (trained in the Unites States) will care for your child while you enjoy some alone time. If you need babysitting it is a small price after hours (just a cheap as a babysitter in the USA). They even have kid friendly shows every evening so your small children can enjoy the Beaches nightlife too! One thing we constantly noticed was that the resort staff here LOVES kids. It isn't just the people caring for the kids at Camp Sesame. Even the people working in the restaurants would get the biggest smiles on their faces when they'd see children come in. In fact, we were at Barefoot by the Sea one of the mornings for breakfast and a kid ran by on the boardwalk and one staff member (female) turned to the other (male) and said "Oh look how cute that kid is! He looks so happy!" and they both smiled and waved to his father who was chasing him, then the male staff member called out "Be careful!". I couldn't believe how attentive they were. Most resorts we go to people who work there don't bother interacting with anyone unless they are right in front of them. But at BT&C and at all Beaches/Sandals properties I've noticed the staff always goes out of their way to be friendly, say hello, and make you feel like you're right at home. This is why I've always loved Beaches/Sandals! 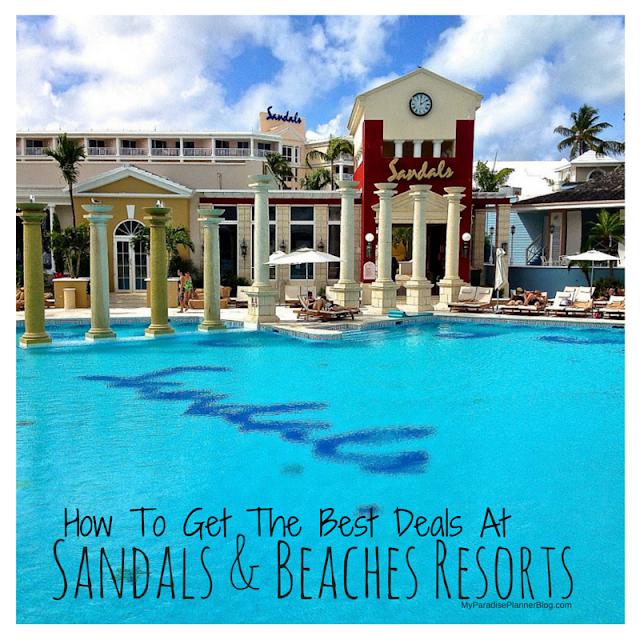 Before visiting this resort I assumed that Beaches was only for families or groups, but now I see that even a honeymooning couple would have a blast at BT&C and still feel the secluded romance of a Sandals honeymoon. In face, there is SO much for the kids to do here that they very rarely bother you. These kids have a full itinerary. There are so many pools, and with the water park and the Xbox room and the Camp Sesame, we sometimes forgot there were kids around at all! Now, I recommend this property to all of my clients and am constantly talking it up to everyone we know. The best part of the entire thing, everything you read about above.. is ALL INCLUDED. That's right. One price pays for everything above. So next time you take a look at a Beaches vacation and cringe at the price, THINK AGAIN! Look at everything you get for your money and you'll know that not only is it worth it, but it's actually a BARGAIN! 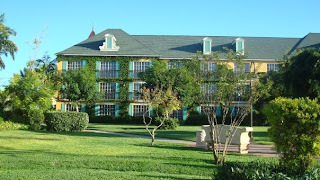 CLICK HERE for more information and photos of this amazing resort! Contact Kira@MyParadisePlanner.com for price quote today!